High degree of innovation and a modern design. 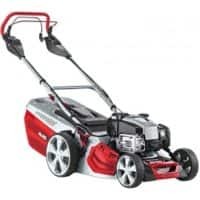 The Alko Highline 476 SPI is a powerful mower with easy electric start making for simple operation. With a cutting width of 46cm (18″), the Highline 476 SPI petrol lawn mower ensures quick progress even in large gardens (up to 1400 m²). The cutting height adjustment is carried out centrally in up to 7 stages from 30 mm to 80 mm. The 2.6 kW Briggs & Stratton engines are easily started at the turn of a key and the overhead valves offer excellent efficiency, resulting in more power and less fuel consumption. Thanks to the wheel drive and the XXL lightweight wheels, it’s easy to move the mower around the garden. The 4INONE function offers mowing, collecting, mulching and side discharge of the grass. The ergonomically shaped handlebar increases comfort while working and the optimum cockpit design ensures that all controls are within easy reach. The grass clippings pass through the extra-high steel sheet mowing deck with MaxAirflow technology to the rear of the 70-litre collector with level indicator, filling it up to the top meaning the grass box needs emptying less frequently.